Night photography and using lights to selectively light a scene (Light painting) is both rewarding and taxing. Standing outside can be very cold with bare or lightly covered fingers touching freezing cold metal. Some of these pictures were taken at a wind chill of - 27C (-17F). Each shot is for about 30 seconds to get the stars to appear. When it is very dark, a 20 watt bulb will light the inside of an old building. An ordinary flash light will light up a building such as the old house or shop below. The shot with the old truck was done completely with a small Maglite. (Careful - Ghosts.) A 20 million candlepower spot light was used for the big barn when it was farther away. I usually shoot with friends so we can share duties of lighting up the buildings and of course, stay safe. I intend to continue experimenting with this medium and adding more pictures to this gallery in the future. I hope you enjoy them. 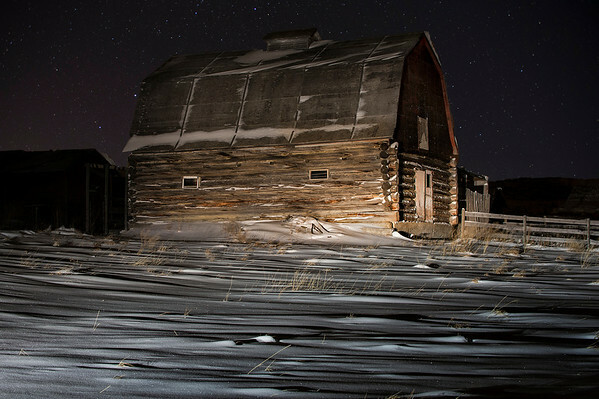 Old log barn not far from Calgary.